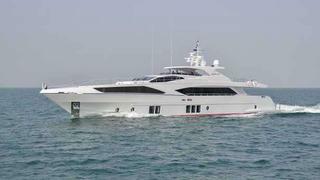 Gulf Craft debuted its new 37-metre Majesty 122 at this year’s Dubai International Boat Show. The new Majesty 122 was among three yachts that Gulf Craft launched in one week in January 2015. The superyacht becomes the fourth largest yacht in the UAE builder's comprehensive Majesty Yachts range, which now runs from a Majesty 48 at 14.6 metres to the flagship Majesty 155 at 47 metres. The new Majesty 122 fills a gap between the 105 and the 125, boasting an exact LOA of 37.5 metres. She has a beam of 7.6 metres and draws 1.9 metres. The yachts’s range will be large as she has a fuel capacity of more than 25,000 litres. The lines are as sleek and angular as others in the Majesty range and in keeping with Gulf Craft’s characteristic styling. The yacht was displayed at the Dubai show, from 3-7 March 2015, at the Gulf Craft stand alongside an array of the UAE-based builder’s current lineup of superyachts, sport cruisers and leisure craft. In 2014, the UAE ranked in the top 10 yacht building nations as number nine in the Global Order Book, with Gulf Craft leading in the yacht building industry regionally.